If you haven't seen the newest range from SFD, then here's a sneak preview for you. 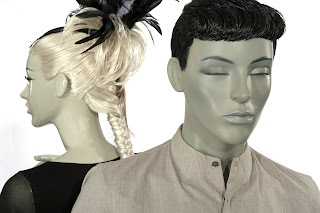 Their "new range of mannequins designed exclusively by SFD introduces a contemporary and stylish vision with a mixture of abstract and realistic features". "The collection named PULSE brings movement and drama back to the mannequin world, enabling the client to be as extravagant or as commercial as their needs require". "Aged between 12 and 24, the PULSE range incorporates slim male, elegant female and teenage figures". 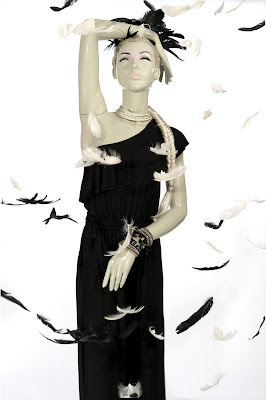 "The versatility of this range creates an attractive proposition for high-fashion brands, using the dramatic poses which will work well in-store and in the windows, and also for high-street retailers who may be looking to use a family of innovative mannequins". "PULSE differs from other mannequins on the market at the moment with their exaggerated poses and represents a shift change back towards realistic figures". "The semi-realistic figures provide an innovative balance between the minimal maintenance of abstraction and the impactful nature of realistic mannequins". "Designed by [the ever talented] Christopher Willey in conjunction with the creative team at SFD the new range also showcases [their] bespoke mannequin production capabilities". "From initial concept, 3D visualisation and sculpting, through to eye catching wigs, make-up and clothing". If you can make it to the VM and Display show at the business design centre this week, do go and check these guys out. There are a tonne of brands out there that are biting their hands off for this collection.